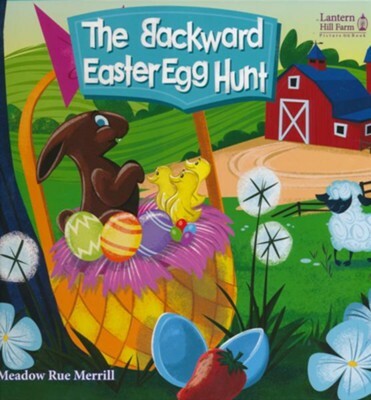 The Backward Easter Egg Hunt is a children’s book by Meadow Rue Merrill. This book was published by Hendrickson Rose Publishing under Rose Kids. This book is part of the Lantern Hill Farm series for children of all ages. This book will be released in March and will be available as a board book and hardcover. Other books in this series include: The Best Birthday, Light Parade, and The Christmas Cradle. It’s almost Easter and six-year-old Molly is over the moon with excitement. Like many kids (and some adults) Molly doesn’t know the real meaning behind Easter. She thinks Easter is about sparkly new dresses, baby chicks, fuzzy lambs, and her Aunt Jenny’s annual Easter egg hunt at Lantern Hill Farm. When Easter finally comes around, Molly’s mother says Aunt Jenny has something different planned for this year. Instead of hiding eggs around the farm for the kids to find, Aunt Jenny gives the kids empty eggs and a list of things to fill the eggs up with. Aunt Jenny uses the Easter egg scavenger hunt to teach the children about the real meaning of Easter… Something prickly was for the nails and crown of thorns, and the red was for Jesus’s blood. Something living and dead was for Jesus’ life and death. Something heavy was for the stone that rolled over Jesus’ tomb, and when Jesus rose it was rolled away like a feather. Something dark and something bright were for Jesus taking away our darkness (she doesn’t call it sin) and filling us with light… I would have liked to have seen some Bible verses, and a little more depth. Children will definitely love this book! The illustrations are bold and colorful, and the characters are racially diverse. The artwork style looks very familiar, but I can’t place it. I have never heard of backward Easter egg hunts until now. Did the author just invent this? Or have I been living under a rock? I think it would be a really awesome to do with your family or church youth group (or students if you teach at a Christian school). For those who hold to images of Jesus being a 2nd commandment violation (2CV), there is a picture of Jesus on one page that can be easily covered.